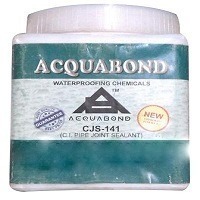 Acquabond CJS 141 has been developed to overcome all these drawbacks. Besides outstanding properties, low cost is plus point of this product. Acquabond CJS 141 works out much economical than lead as its density (1.95gm/cc) is 1/6th that of lead (11.35gm/cc). It is also an import substitute as 50% of total lead consumption is imported into India.